These options allow you to configure things to let Easy2Sync run automatically. No message box on copy errors: You may turn off the message that appears when a file could not be copied. That happens for example when the destination file cannot be overwritten, because it is still opened in an application. Activate it only if it is important that Easy2Sync runs on its own (for example, for a server that runs without anyone looking). Send status e-mails: You may tell Easy2Sync to send you and email if the synchronization cannot proceed due to a request. Of course, the computer needs to have access to a mail server for this. If you activate this option, a window will open and allow you to configure the mail server details. Execute even if > 30% will be deleted: If more than 30% of all files would be deleted, normally a request will be issued. Since this is not possible for a service, you may configure here, if the synchronization should be continued or not. Create base folder automatically: If the very folder that you selected for the sync does not exist, Easy2Sync can create it automatically. Useful for rotating backups. Automatically start with Windows: This tells Easy2Sync to start automatically after Windows has booted. ...but with a 30-second delay: Because many things are started along with Windows and might block everything. 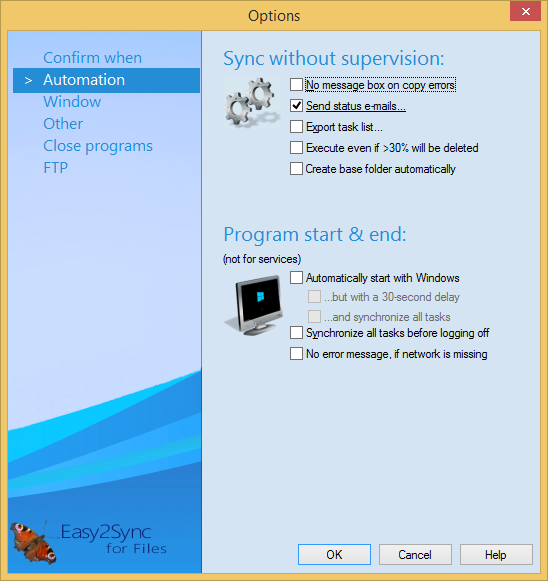 ...and synchronize all tasks: If you activate this item, Easy2Sync will synchronize all tasks when Windows is started. Synchronize before logging off: You may configure Easy2Sync to remind you before logging off. Easy2Sync must be running for this (for example minimized in the tray). If you now log off, you will be asked if you want to synchronize all projects before actually performing the log off.